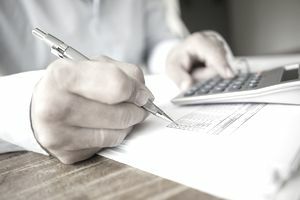 When making a business case to invest money into a new business project such as a possible acquisition, or an equipment purchase with a long holding period, it's important to have a way to calculate the potential return or profit you'll gain in the future. This part of the decision-making process can be handled with the future value formula and a few inputs. You can use any of three different ways to work the formula and get your answer. Each method uses a different means of calculation, but the underlying formula is the same in all three instances. The first part of this equation, (FV₁ = PV + INT) reads, "the future value (FV) at the end of one year, represented by the subscript letter ᵢ, equals the present value plus the added value of the interest at the specified interest rate. The next formula presents this in a form that is easier to calculate the value added by the accrued interest ( PV(1 + I)ⁿ) which reads, "the present value (PV) times (1 + I)ⁿ, where l represents the interest rate and the superscript ⁿ is the number of compounding periods. You can continue this process to find the future value of the investment for any number of compounding periods. Spelling out this process way, manually performing each year's added value from interest, then using that value to make similar calculations for each following year, makes it clear how we're arriving at the result, but it's time-consuming. Solving for a future value 20 years in the future means repeating the math 20 times. There are faster and better ways of accomplishing this, one of them being the use of a financial calculator. Although it doesn't quite look like it, this is the same formula we used when we did the calculations manually. Take note that you need to set the investment's present value as a negative number so that you can correctly calculate positive future cash flows. If you forget to add the "minus" sign, your future value will show as a negative number. The advantage of the financial calculator over the manual method is obvious. With the calculator, it's no more difficult or time-consuming to solve for a future value 20 years from now than to solve for a single year. Another time-saving method uses a spreadsheet. The earlier versions of Excel require that you click on Calculate to see the result. Later versions calculate the result automatically. In Excel, you must also enter the present value as a negative number so that you achieve a positive outcome for future cash flows. How Do Banks Establish Interest Rates? What is the Difference Between Stated and Annual Percentage Rates?